From beautiful bowls to stunning wine glasses, her work includes candle holders, champagne flutes, coffee and dram glasses, goblets, tumblers and water sets. 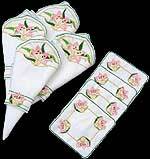 There is also a range of matching table linen and embroidered giftware. Together these make superb wedding presents and housewarming gifts. All items can be gift wrapped and sent with a personal message at no additional cost. We currently have some super discounts on a wide range of items including gift bags and table linen and all wine glasses, flasks, candle holders, paper knives, cuff links, pocket watches and jewellery. In addition to our own range of hand painted glassware and embroidered table linen and giftware items we now offer a fabulous range of gifts from selected UK Makers including Friendship gifts from D & J Glassware, stained glass giftware from Winged Heart and jewellery and giftware from Sea Gems and St Justin. Buy online using the secure WorldPay system or by mail order. We ship worldwide.